Jurnal Administrasi Publik (JAP) aims to explore theoritical grounds for both public policy and management, to disseminate results of conducted particular policy analysis and research, as well as to bring public policy and management theories into best practices. 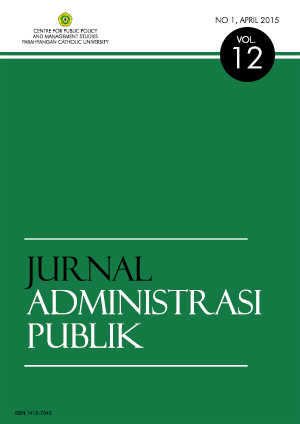 This volume of Jurnal Administrasi Publik (JAP) deals with sustainable urban development in the context of city management in Indonesia. Articles varies in many ways representing different localities of Indonesia, issues discussed in each articles, theoritical perspectives used, as well as institutions in which the writers are affiliated.